A very lucky writer indeed. 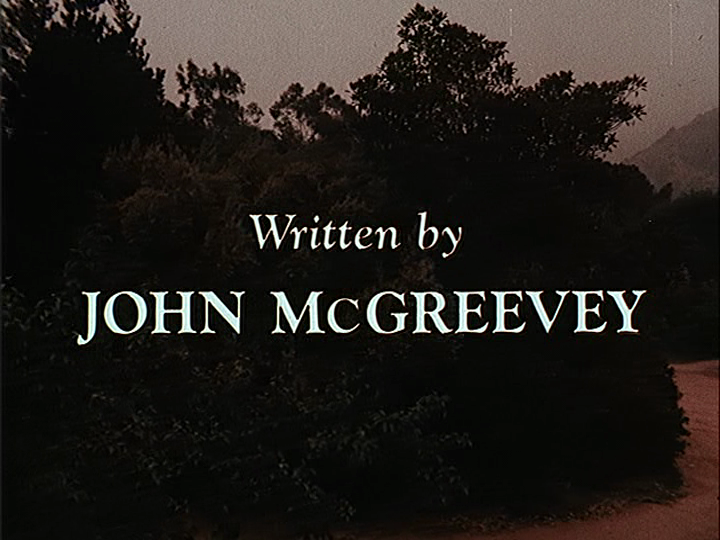 John McGreevey’s scripts were always intelligent and articulate, no matter the show that was lucky enough to have them. Our cultural history is richer for having had him in it. Thank you for this lovely tribute. Sorry for your loss. Can understand what you feel, for my dad died May of ’09. Michael, I am so sorry for your loss. I met you once in Fort Wayne. My mother Mary Richardine and your father were first or second cousins. I always tuned in to both My Three Sons and The Waltons to see if your dad had crafted the episode. What a heartwarming, misogynistic legacy. Thank you for this lovely write up….Only just found it, but I’m Michael McGreevey’s daughter, John McGreevey’s granddaughter. I was missing my grandparents tonight and googling my grandpa’s name (strange thing to do, but with all those credits, a lot comes up) and found your obituary. All I can say is thanks for remembering my grandpa. Thanks, Heather. Replies like yours are what keep me going on this blog. You’ve made me sorry once again that I never got to know your grandfather. Dear Heather, I am so happy to have read your reply. I was looking at a treasured photograph of John and Nota today. A gorgeous picture of them kissing at your wedding. It came to me as a Christmas card in 2008, and I have had no communication since. I looked up John on the internet today since I was missing he and Nota and had a feeling that there was a reason why I had not heard from them for so long. They were two of my most treasured friends for almost 30 years, although I only saw them on their visits to England. I first met them on my wedding night on 11 September 1979 at Gravetye Manor near their beloved Glyndebourne. I fell in love with them both that evening. Meeting them was one of my life’s greatest gifts. I too had a difficult childhood, and often wished they had been my parents. Am I right in assuming that Nota too has died? This is a sad day, full of the very happiest of memories. I knew Nota back in 1969 when I did her hair at a salon on Ventura Blvd…she was my favorite client and I could listen for hours about her talking about John and the kids…..I have soooo often thought of her. I got married in 71 and never went back to hairdressing. She came to my wedding. Sept 11, 1971….over in Burbank…tell her I said hell-o…I lost my husband suddenly 4 years ago. Send my love!!! This morning a friend of mine mentioned his friends, a writing team, Larry Cohen & Fred Freeman, which made me assume they knew John. My dad had breakfast with John most mornings for a long stretch of time at the Wellington. I had one very memorable breakfast with them when John relayed many of his writing experiences. I used Google to make sure I spelled “McGreevey” correctly for my friend and this page came up. It provided a pleasant walk through some meaningful memories of John and my dad. Thank you. How touching to see the picture continuing to be painted. Having just reread this obituary, I noticed something that is unwritten but perhaps implicit in the descriptions of the sensitivity of this lovely man, and that being what a deeply spiritual being John was. His humanity revealed a strong inner life, and that is what I connected with although I didn’t realise it at the time. Nota mirrored his depth and together they stood strongly side by side, but never leaning on one another. Another thing that came to mind was what a hugely cultured couple John and Nota were. Nota was a great collector of indigenous art which I once saw on a visit to their apartment in La Jolla in the late 80s when for a brief spell I live in California. However being British and living in the UK I experienced more regularly their passion for opera which seemed to be one of the motivating forces that brought them to Europe each year, and how I first met them in 1979. They are much much missed. I think of them most days.